Visitors are invited to immerse themselves in a hot bath of Atlantic Seawater infused with hand harvested seaweed and enjoy Ireland’s oldest spa treatment at Connemara Seaweed Baths in Leenane, County Galway. Situated on the shores of Killary Harbour – Irelands only fjord, Connemara Seaweed Baths are the only salt water seaweed baths in Connemara. Our seaweed is hand cut daily and fresh with essential nutrients and minerals. Bathing in Salt Water (Thalassotherapy) is essential for the release of minerals and nutrients found in seaweed and is Ireland’s oldest spa treatment. As well as relaxing tired and aching muscles, saltwater seaweed baths provide a natural cure for skin ailments from psoriasis to eczema and also help relieve associated pain of arthritis and rheumatism. Connemara Seaweed Baths are situated beside the Leenane Hotel. We have six single baths overlooking Killary Harbour and two double rooms at the rear. The atmosphere is one of peace and tranquility. 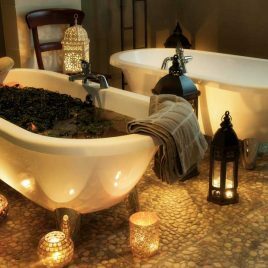 Soft music and candlelight set the mood for total relaxation.